When it comes to the battle of the phone operating systems, people like to look at market share and claim it’s the definitive measure of success, but simply getting phones into people’s hands is only part of the equation. The real measure of success in my view is how well you monetize that market share. And according to recent data from Opera, iOS is winning the monetization wars hands-down. Let’s start by looking at those market share numbers. As you can see from the chart below from comScore for May 2012, Google Android had a substantial lead over its nearest competitor with 50.9 percent of US mobile market share versus 31.9 percent for Apple in second place. The closest competitor after that was RIM with 11.4 percent. 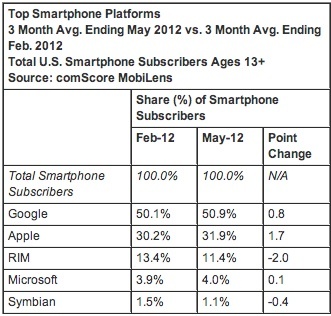 comScore US Mobile Market Share for May 2012. Courtesy of comScore. But the Opera numbers looked at some different metrics over and above pure market share. It started by calculating eCPM, which measures the effective cost per 100 ad impressions. In spite of Android’s substantial market share lead, iOS lead the eCPM metric with an average eCPM of $2.85 verus $2.10 for Android. For the record, Windows phones were at the back of the pack at just .20 (ouch). And when Opera measured the percentage of revenue, iOS really shined. It had more than 46 percent of traffic and 61 percent of revenue on the Opera platform. Compare that with Android, which had over 24 percent of traffic and 25 percent of revenue — and you are looking at a fairly substantial revenue and traffic gap (especially when you factor in that overall market share lead). It’s only one report of course and it’s only one source. Perhaps it says more about the people who use Opera’s ad platform, but it’s telling nonetheless because it provides at least a couple of monetization data points that we haven’t seen before. I never liked market share as a measurement of success. For starters, there are many different Android phones of varying quality from excellent to crap from a variety of manufacturers. There are only a few iPhones and they are all from one manufacturer, Apple. Simply comparing market share by operating system clearly doesn’t tell the whole story. 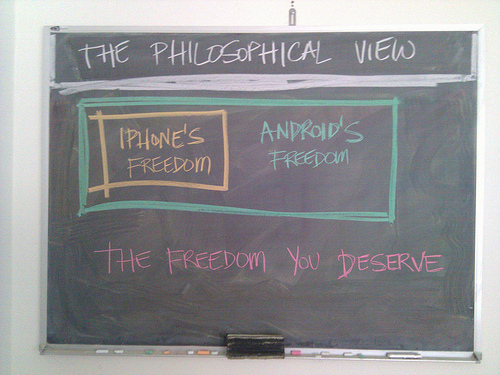 What’s interesting here though is that Google created Android to provide additional eyeballs on the Google system. What Google does best is sell ads and monetize content, yet it’s Apple that’s winning the monetization battle, at least according to this data. Whatever you think of these two phone operating systems, and I know there is a lot of passion behind each one, it’s an interesting twist on typical ways of measuring mobile phone operating system success. Photo by zugaldia on Flickr. Used under Creative Commons License.